April--Back in our Summer Home! April went pretty much as planned. 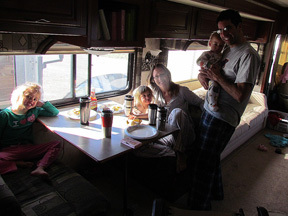 We flew into Southern California, and spent time with Carmen and her family and got ready for our summer adventure along the Pacific Coast Highway. Two things are different in this picture - six brand new tires for the RV and a brand new four wheel drive SUV (2011 Ford Escape Hybrid). 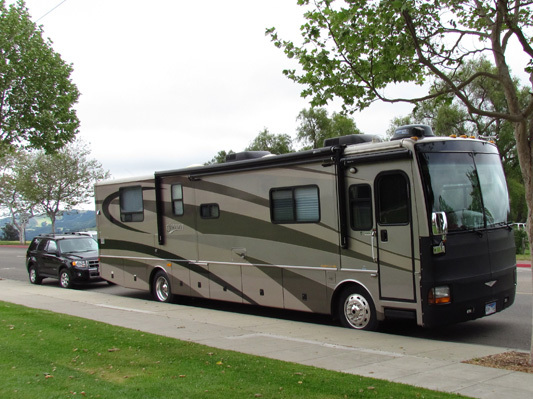 While the RV can only get eight miles per gallon, it makes us feel better knowing that our tow vehicle gets 32+ MPG. 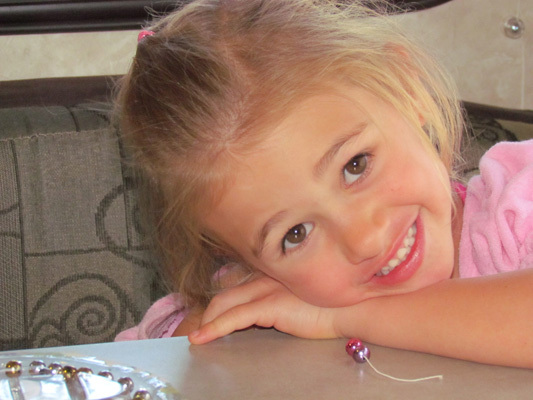 Life is quite different with growing grandkids. You never know what to expect. Here Dakota is helping her Mom make Friday night pizza. Sierra was not going to sit this one out, so she rolled up her sleeves (figuratively) and got to work rolling out her dough. "Watch me!" Hunter says to his sisters. 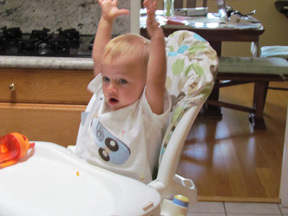 "Spin the pizza as you throw it up into the air. Be sure to catch it!" 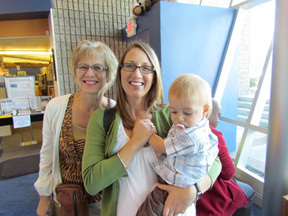 Nana, Carmen and Hunter anxiously waiting outside the auditorium for Dakota's first piano recital. Hard to imagine this little five year old in front of hundreds of people playing a couple of tunes she learned from her piano instructor. 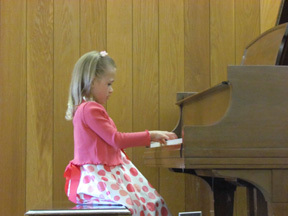 Nice Job, Dakota!! And the family could not have been prouder as they joined Dakota as she showed off her first recital medallion. 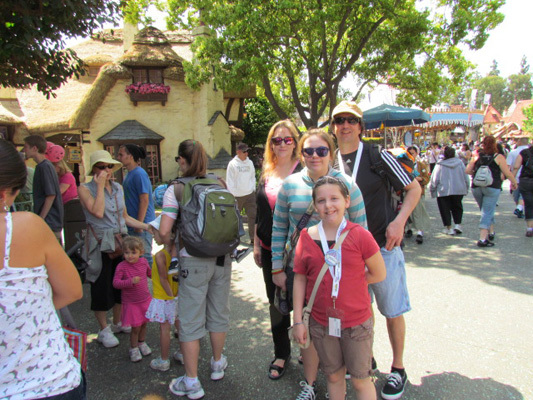 Steve and Elaine Barnhardt drove from Eugene Oregon to spend three days at Disneyland. 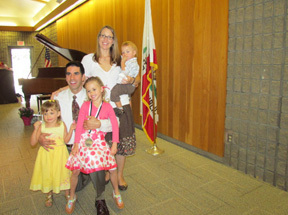 Here they are with two of their four children. We tried to stay together for a while but with seven children it was like herding cats. One of Dakota and Sierra's favorite things to do at Disneyland is to meet and greet the princesses. 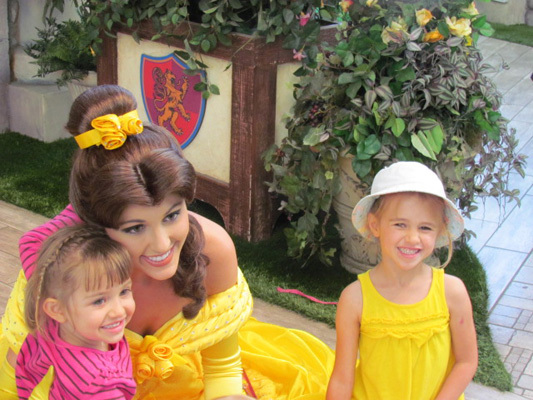 Here they are with Disney Princess, Belle, from Beauty and the Beast. 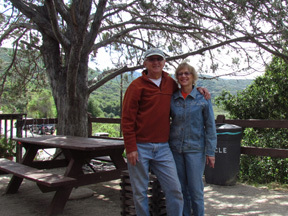 Our first RV outing was at Rancho Oso Guest Ranch and Resort in the mountains near Santa Barbara. Carmen and the kids' road up with us in the RV and Mike joined us after work on Friday. 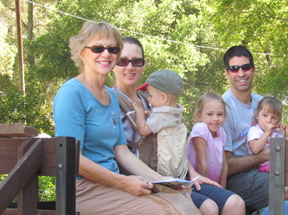 Here we are on a hay ride, watching some of the ranching operations of the resort. Ah--time to kick back and relax! 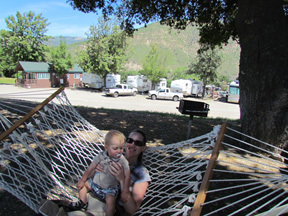 Here Carmen and Hunter are trying to get situated on the hammock. 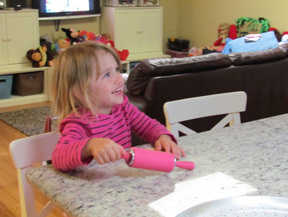 It is difficult enough for one person, but with a squirming child, it is all together a different challenge. 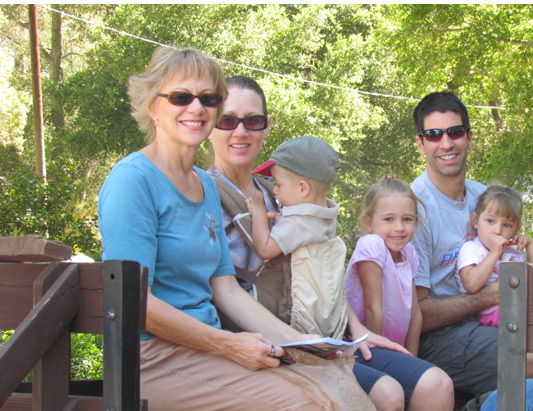 Rancho Oso is very kid friendly which kept them busy throughout the weekend. Along with a pool and playground, they had the kids do a scavenger hunt and find a list of things located throughout the park. 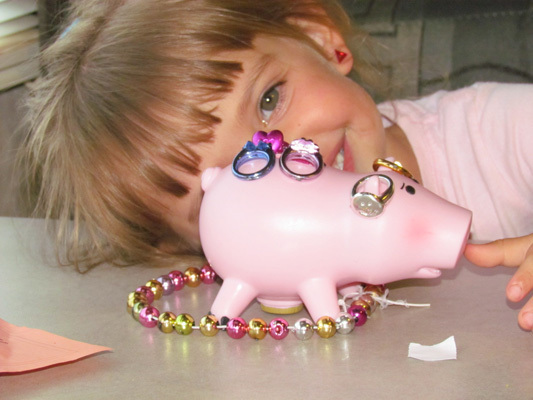 And if the planned activities were not enough, the prize for completing the scavenger hunt was a jewelry kit that Dakota and Sierra had to assemble. 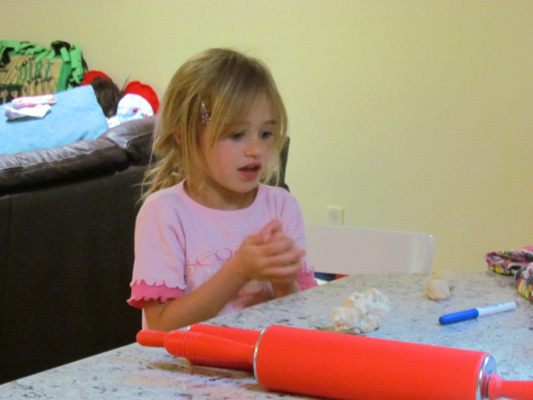 They were very proud of their creations. Seven people in the RV over the weekend worked out much better than one would have imagined. The sliders helped by providing lots of space for the kids to play and for the wall to wall beds at night. One of the natural beauties of this resort was a waterfall. 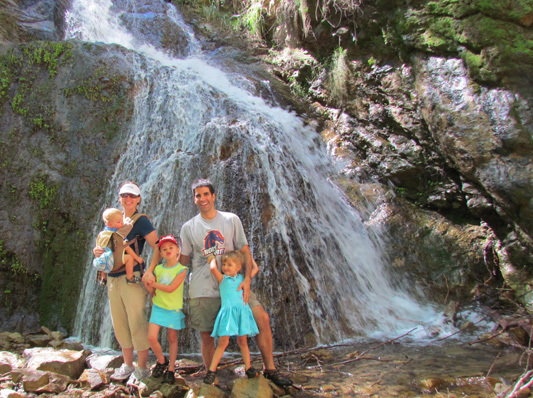 So we all hiked up a trail (except Hunter and sometime Sierra who needed to be carried) and took in this breathtaking waterfall. 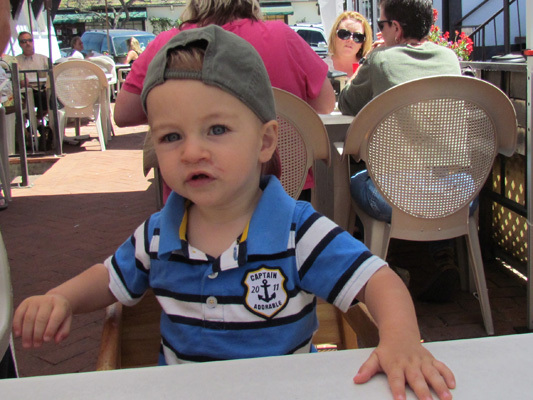 Before the kids headed back to Fullerton, we toured Solvang, a nearby tourist town dubbed "Danish Capital of America." The town was established in 1911 and will be celebrating its 100th anniversary this summer, with a visit from His Royal Highness the Prince Consort Henrik of Denmark, to acknowledge the historic, cultural, and business ties to Denmark. 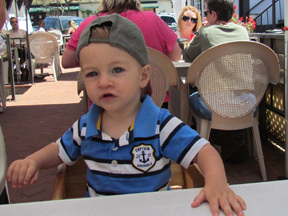 Hunter is patiently waiting for some of the great Danish food we just ordered. 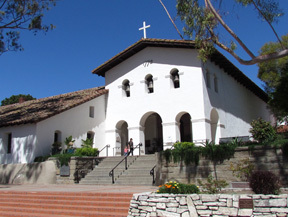 Another unique attraction we included in our tour were the missions along California's El Camino Real (The Royal Highway) from San Diego to San Francisco. These 21 Spanish Missions represent the first arrival of non-Native Americans to California. 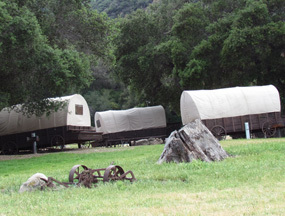 In addition to Christianity, the missions brought many other things to California such as livestock, fruits, flowers, grains and industry. As with most white settlements, these missions had varying degrees of success imbedding themselves with Native Americans. 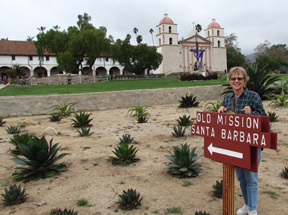 Santa Barbara (named after Glorine Barbara Barnhardt) was the first mission we toured. 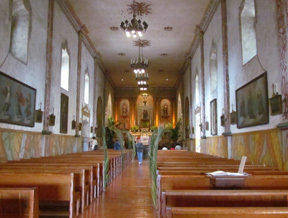 It was the 10th of the 21 missions built and has a rich history that dates back to 1782. 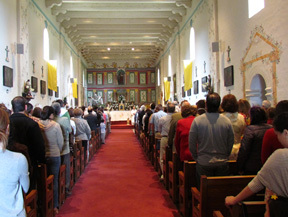 Earthquakes, fires and effects of time altered the church through numerous renovations. One of the features of the Santa Barbara mission is that it houses the archives and documents for the entire California chain of missions. It is also the only mission with two steeples. While many of the things we see and do on this trip come from tour books, many more are things we "stumble" into like this place--Paradise Store, located a few miles from the RV park. It is also a biker bar, with an outdoor restaurant and live bands. We arrived early one Saturday and were waiting for the musicians to arrive. The weather is a bit cooler than we expected--sunny California--it was not! If you did not have your own recreational vehicle, the RV park had a few to rent out. 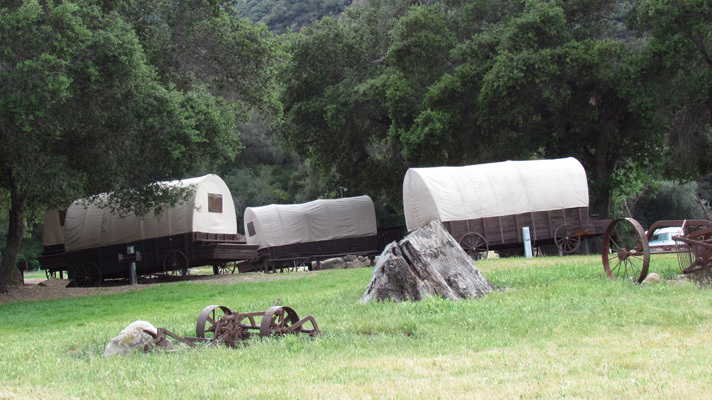 These covered wagons are equipped with running water and electricity. Small but cool! 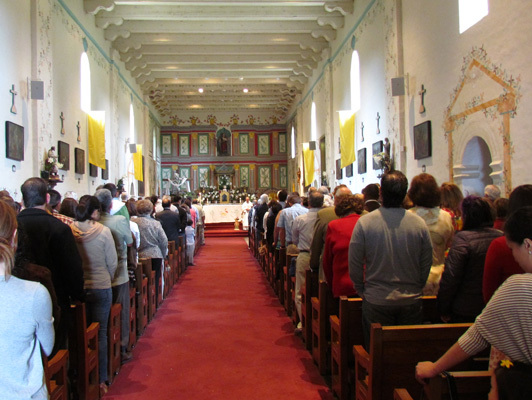 Easter Sunday, we attended Mass at Mission Santa Ines (Saint Agnes) in the village of Solvang. It was the last of the 21 missions to be built. Notice how small the mission is--four people to a pew, so most of us stood outside for the service. 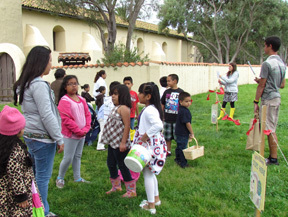 As mass was finishing up the kids were already preparing for the beginning of a huge Easter Egg Hunt. The kids were divided into age groups and sent out into the Mission grounds to find as many eggs as they could. Our second RV park was the Pacific Dunes RV Resort and Riding Sables in Oceano, California near Pismo Beach. 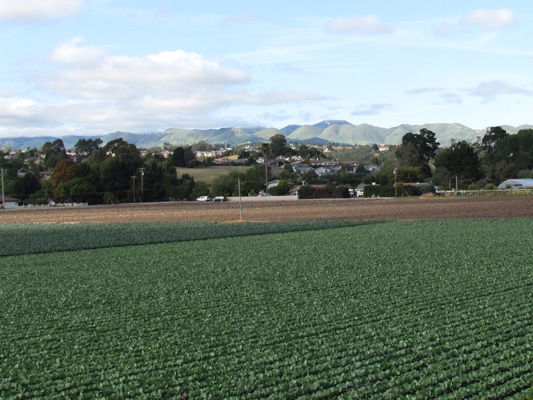 As we drove along the country side, we were quite impressed by the massive fields filled with every crop imaginable. 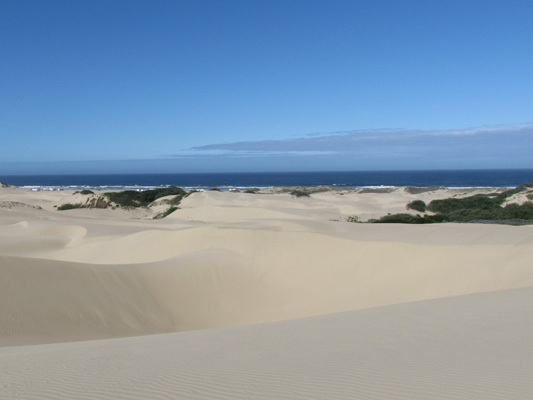 Yes it is called Pacific Dunes because the RV parks sit atop a hill that overlooks the most extensive coastal dunes remaining in California. 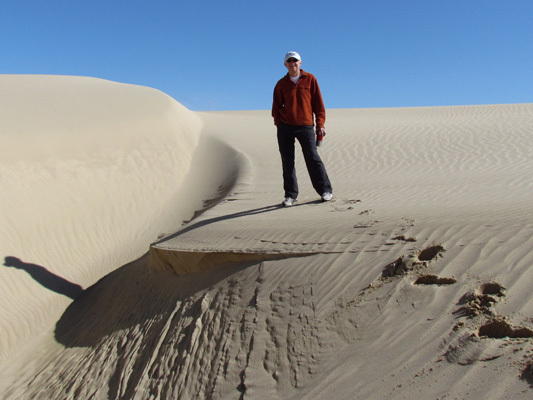 One morning we went for a hike on the dunes and it reminded us of the snow drifts we used to play on as kids. 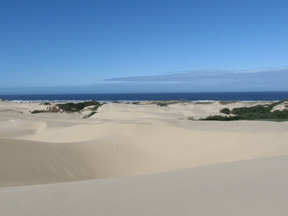 This dunes is nearly a mile wide and stretches up the coast for five miles. 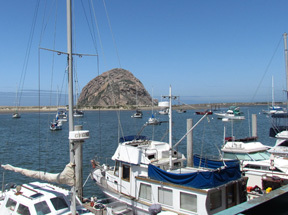 One of the area attractions is Morro Bay with the monolithic rock in the harbor. 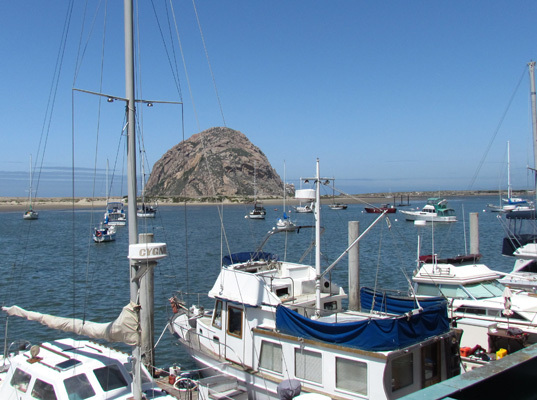 This rock is one of seven worn-down ancient volcanoes that extend in a line from here to San Luis Obispo. We did a lot of hiking in two area state parks where we could get glimpses of the rock. 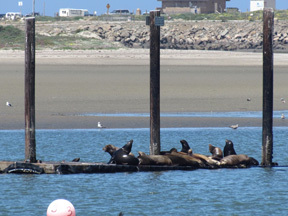 Harbor seals are nearly everywhere along the central California coast. 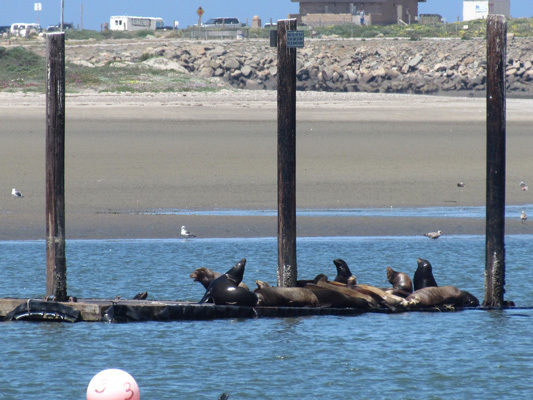 Here are a half a dozen sunning themselves on an old dock floating in the harbor. Being six feet long and weighing nearly 300 pounds, they are quite awkward out of the water but rather graceful when swimming. While hiking along a cliff near Morro Bay, we saw hundreds of rock formations and took a ton of pictures. 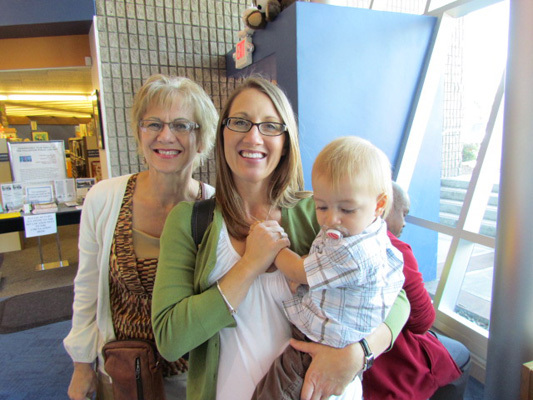 Here is just one that the rough waters hollowed out. 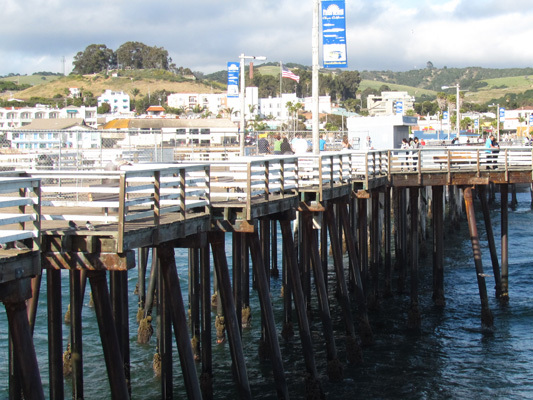 One of the main attractions of Pismo Beach is this wharf that extends out nearly 1,400 feet in the ocean. 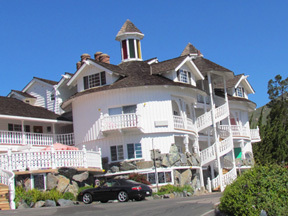 It is a replica of one built back in the 1880s built mainly for commercial use that was destroyed in a storm in 1983. 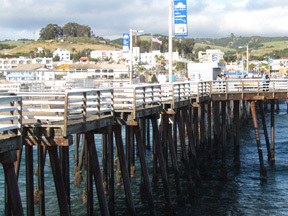 It is now use primarily for sport fishing and fine dining. Between Pismo Beach and our campground is an area that they allow vehicles on. 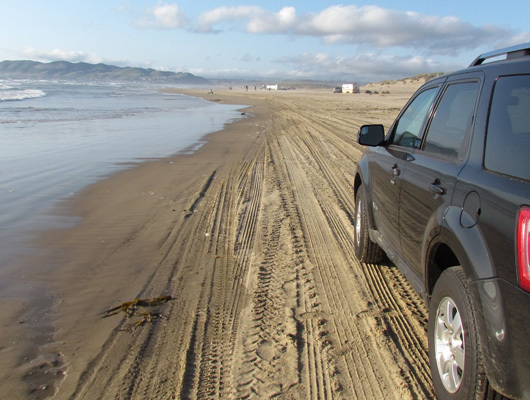 So we took the new Escape for a test drive in the ocean. And I mean in the ocean. Thank goodness it only came up to the bottom of the wheel. 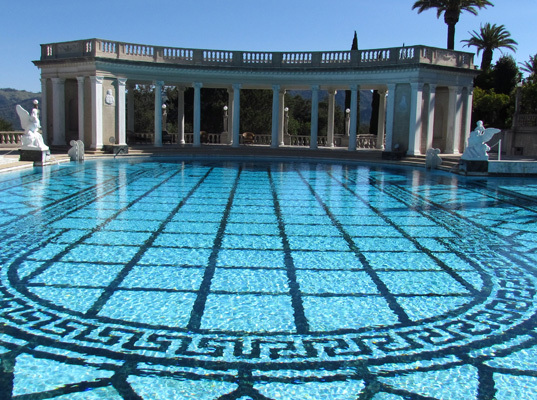 The Hearst Castle has been one of the biggest highlights of our trip thus far. 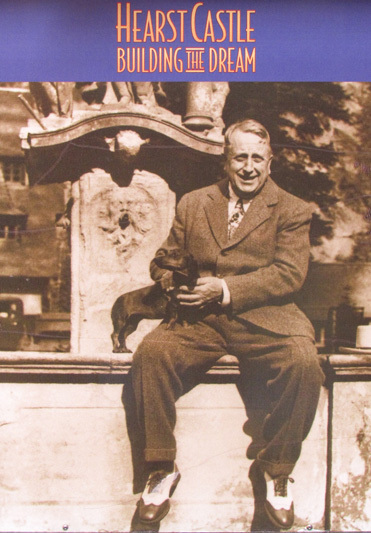 It was as much about the vision of William Randolph Hearst who inherited the land from his parents at the age of 56 in 1911. His dream came to life over the course of 28 years, thanks to the designs of architect Julia Morgan. Whether you are a mile away or in the castle, it is nothing short of magnificent. This picture was taking from the tour bus that takes tourists from the main entry up the mountain top. Breathtaking views from every direction. This is facing west and we did not stick around for the sunset, we saw pictures that were just stunning. Here is a view looking north. The entire Hearst property once comprised of nearly 250,000 acres, so this picture included all of what once was the Hearst estate. The castle is made up of several buildings. 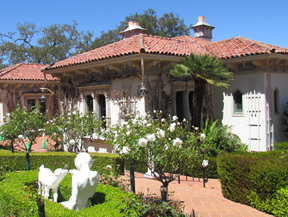 This guest house consists of four bedrooms, each with its own bathroom. 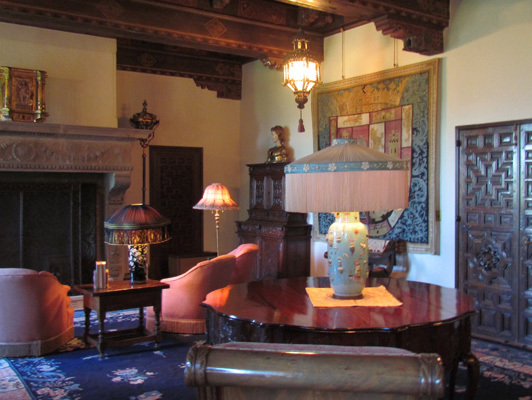 No eating accommodations were provided because it was expected that all guests would eat together. 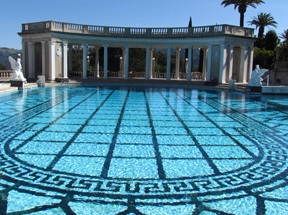 The Neptune pool was designed after the Greek Coliseums and is over 100 feet long and 50 feet wide. While it gives off a blue tint, the bottom is made of black and white tiles. The blue is a reflection of the sky. 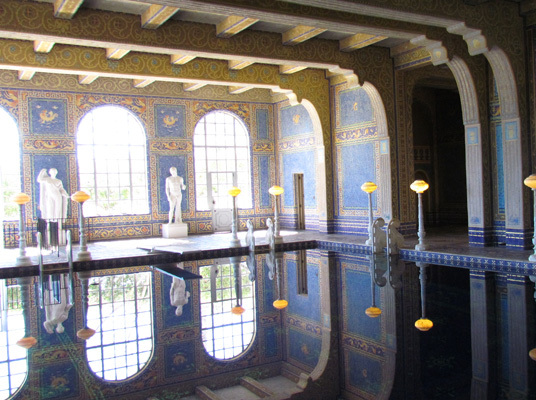 And heaven forbid the weather got bad, the Hearst's provided guest with an indoor Roman Pool, styled after an ancient Roman bath. The pool, walls and ceiling were all mosaic tiled patterns found in the 5th century along with the eight marble statues. 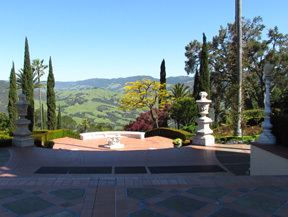 These 12 acres of gardens, terraces, and pools pale in comparison to the pain staking planning and designing of each of the 165 rooms (56 bedrooms, 61 bathrooms, 19 sitting rooms, etc.) in four buildings that made up the castle. The artwork is all of museum quality with some dating back to Roman times. 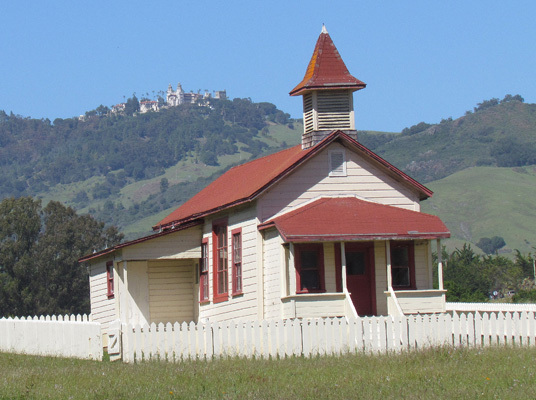 This old church is one of a few buildings that remain in San Simeon, a tiny community along the coast with the castle in the background. 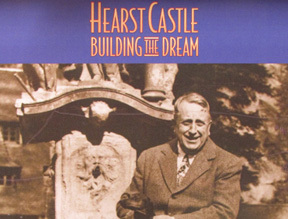 The Hearst Family owns the land that stretches five miles along the shoreline. 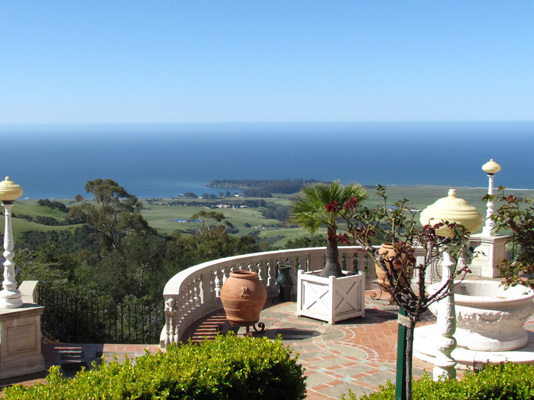 This along with the rest of the roughly 120-square-mile cattle ranch that surrounds Hearst Castle, is a "conservation easement" which prevents future development. 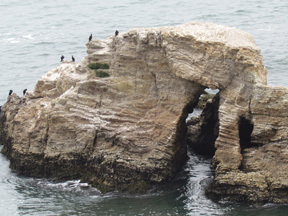 Nearby all this man-made wonder is a natural wonder--Elephant Seals. These seals are all females. The males have taken the young calves out in the ocean to teach them how to fend for themselves. 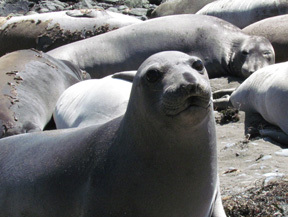 The males have enormous noses--thus the name Elephant seals. One last stop while we were in the area was San Luis Obispo. 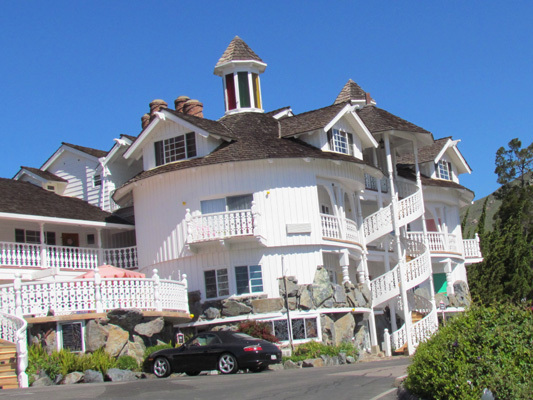 Here we saw another man-made wonder--the Madonna Inn., names after a local rancher. Each of the rooms of the Inn is eloquently decorated with a unique theme, which makes it a big hit for honeymooners and other special occasions. 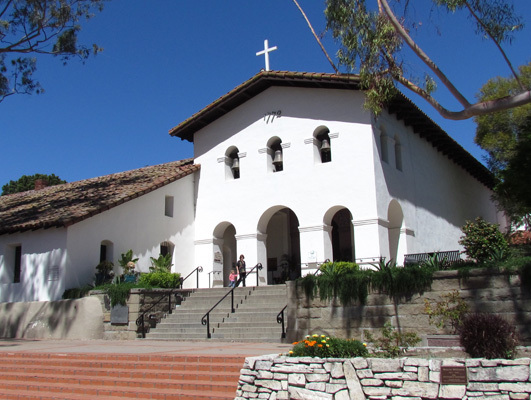 Mission San Luis Obispo (built in 1793) was in the center of town with a small creek running alongside of it. The history of this mission was brutal, especially with the local Native Americans, who tried but failed to drive the white man out of the area. 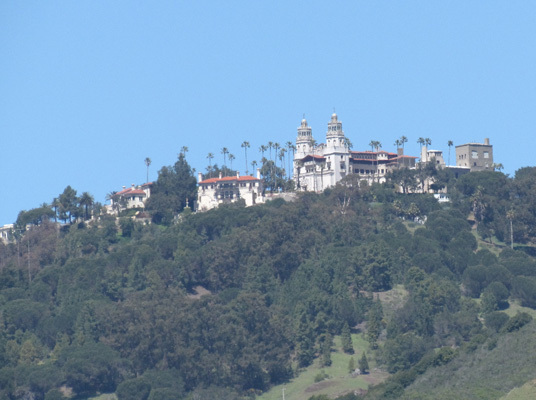 San Luis Obispo is a cute university town but a little over rated from what we saw. 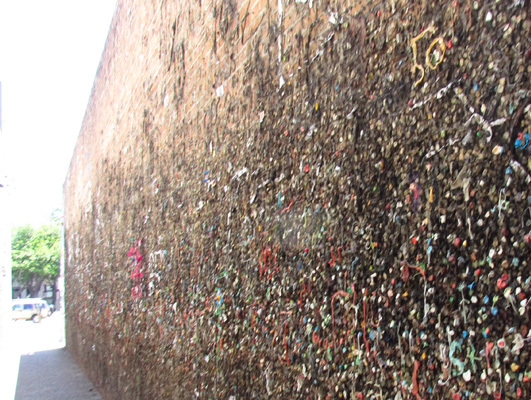 Here is a small alleyway with a wall full of bubblegum. 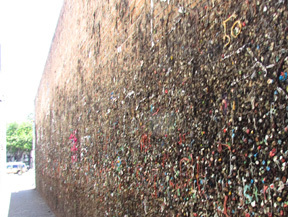 It was one of the major tourist attractions listed on the "things to see." Thankfully, it was the only attraction of all of our adventures that we were not grateful to see.